Land cancel: This works with swords (not great swords, mind you), rapiers, katana, punches, daggers, guns (not the RPG) and bullet souls. Jump. Right before you hit the ground, attack with one of the previously listed weapons or fire off your bullet soul. You'll notice that as soon as you hit the ground Soma's animation is cut short and there will be no lag from whatever attack you performed. By performing a series of very small jumps and land-cancelling an attack at the end of each one, you can attack much, MUCH faster than usual. Very handy. Back dash cancel: This works with all weapons and bullet souls. Attack or fire off your bullet soul. In the middle of the animation, hit L. Whatever Soma is doing will be cancelled. Note: You cannot back dash cancel a weapon attack that was used in the middle of a back dash. Basically what this means is that you can't back dash cancel weapon attacks over and over. Please notice I specified "weapon" attacks. That is because you can back dash cancel soul attacks any number of times. Very handy, especially with your back against a wall. Also note that you can't back dash cancel an attack performed while ducking. Special cancel: Works with any weapon that has a special attack and bullet souls. Attack or fire off a bullet soul and then immediately use your special attack. Just like with the back dash, a weapon's special attack will cancel whatever Soma is doing. Especially useful with Death Scythe because it will reduce the lag after an attack and allow you to hit with a mighty special attack that much faster. Note: You can't special cancel an attack performed while ducking. Werewolf cancel: Works with bullet souls that either do not limit how rapidly you can use them, or bullet souls that have a very high limit on how rapidly you can fire them. Works best with Killer Clown, but also works with Slime, Slogra, Warg, Almaric Sniper and various others. For purposes of Boss Rush, you will only be using Werewolf with Killer Clown. Hold up. Hold R. While still holding both up AND R, press Y as fast as you can. Everything in front of you should die. Comment: Use Erinys while doing a small hop while making your way to the next room. The Guillotiner and Great Axe Armor soul also works but I'm uncertain which is actually faster. Comment: Activate Devil then use Death Scythe special. As simple as that. Comment: Spam Killer Clown while holding down the guardian (werewolf) button. 5 hits should do it. Comment: Start off by land canceling an Abaddon while Black Panthering towards Puppet Master. As soon as you have fired off Abaddon, switch setups either by pausing and switching or by pressing X. The reason for this switch is that when you fire a bullet soul its power is calculated using your INT at the time you fired it; therefore, by using an INT raising setup like setup A to fire off Abaddon, the locusts do significantly more damage than they would if you fired them off using a STR oriented setup like setup B. After you switch to setup B, activate Devil as soon as possible and attack, back dash cancel into another attack, then special cancel. If done properly, the first hit from the Death Scythe will NOT be affected by Devil, but the second hit and the special attack will be. If enough locusts hit him, Puppet Master will die. Comment: Once you enter shoot a Killer Clown card once and activate Devil. If it hits correctly, Dario will fly towards you leaving his back faced towards you. Use special. Comment: Start on setup A. As you fall, inch forward a little bit, fire off Bomber Armor and activate Devil as fast as you can. Because Devil is equipped on both setups, you can switch to setup B while Devil is activating without interrupting the activation, so do so. The instant you land, use a special attack. If you started activating Devil fast enough, then it should be in effect by the time your special connects. If it isn't, either try and get Devil going faster, or just wait an ever-so-brief moment after hitting the ground to use your special attack. Comment: Activate Death, spam back dash and Killer Clown. Make sure to turn off the up+L ability. Comment: Spam Killer Clown while holding down the guardian (Werewolf) button. If done fast enough you'll kill him before you reach him. Comment: Once you enter the room, throw a bomb followed by a back dash and throw another bomb then followed with a special attack. Instant kill. Comment: Make sure both sets have the same bullet soul equipped! If one setup has Slime equipped and the other has Abaddon equipped, then switching setups will cause all of the Slimes/locusts to disappear. Either back dash cancel 9 Slimes before he comes out of the mirror OR wait until just before he comes out of the mirror and use Abaddon so that the locusts swarm over the right half of the room. Whichever you choose, hit X or pause and switch to setup B the instant you finish firing off bullet souls and immediately activate Devil. You'll notice that as Paranoia moves he floats up and down a little bit. If you time it right, you can attack and then special cancel and have both hits connect. Don't worry, it's not as hard as it sounds. If enough Slimes/locusts have hit him he will die. Try a few times with each bullet soul and figure out which one you're more comfortable using. Comment: This guy is tough. Start on setup A. As he comes down, Black Panther to the side, then jump up and use Abaddon on him and immediately switch to setup B and activate Devil. Now for the tricky part. You need to run underneath him and attack, back dash cancel into another attack, then special cancel. Then you need to do it again. The problem is that Aguni is not content to sit around and take your hits. Also, it is quite possible that you will run low on HP, MP or both at some point in this battle. They start you with 2 HP restoring items, so feel free to use one now. MP is a different story, however. You can either use the Mana Prism they provide you with, or equip your Chaos Ring to get some MP back. I would suggest using the Chaos Ring and saving the Mana Prism for Death, but it's really just a matter of preference. In any case, make sure the Megingiord is on whenever you are hitting Aguni, otherwise it may take some extra hits to finish him. If all goes well and enough locusts hit him then it will take 4 attacks and 2 special attacks to kill him. Comment: There are a couple of ways to approach this battle. Start off with Setup A. You have a decision to make: you can either jump over Abaddon (do this if you don't have Draghignazzo) OR you can equip Draghignazzo and charge right through him. If you want to jump over him then fire off an Abaddon as you ascend. If you want to charge right through him, then do a VERY small jump and land-cancel an Abaddon while you still have Stolas equipped. Immediately after you release the locusts, pause and equip Draghignazzo, then unpause andcharge through him. I personally just charge right through him. Whichever method you use, once you're behind him, switch to setup B and activate Devil. Once Devil is in effect, attack, back-dash-cancel another attack, then special-cancel and he should die. If not enough of your locusts hit him then you may need to attack him once more. It is possible to kill him before he gets to summon any locusts of his own, but it is very difficult and also requires a lot of luck. Whatever you do, don't get caught in a locust swarm with Devil activated! If you're going to get hit by the locusts then jump right before they hit you; the locusts won't trap you if you're in midair. Comment: Death can start off with one a few things. If he starts the battle by flying around, then activate Devil, hit him with Abaddon, and then just keep hitting him with the Death Scythe. If the opportunity presents itself, try to back dash cancel and special cancel so you can get more hits in. I believe it takes 4 hits and 1 special to end his first form. Once he starts transforming, if you used your Mana Prism earlier, now would be a good time to briefly switch to the Chaos Ring to get some MP back. Once you can start hitting him again, switch back to the Megingiord. If he begins the battle by using his double slash attack then immediately pause, switch to setup B, activate Death and start back dash cancelling Killer Clown. You'll probably get hit, but ignore it and keep spamming Killer Clown. I believe this start will yield a slightly faster time than if he starts the battle off by flying around. Once he starts transforming, switch back to setup A and activate Devil. If your MP is low, you may want to equip the Chaos Ring to get back some MP, but be sure to reequip the Megingiord before you start hitting him. His second form should be handled in much the same way as his first form; use Abaddon, then just keep hitting him. Don't forget about your Mana Prism if you didn't use it earlier and you need some quick MP! In his second form he is much more likely to stop moving and either throw his Scythe at you, summon his huge skulls, or teleport-slash you. If he throws his scythe or summons his skulls, then get under him and attack, back dash cancel another attack, then special cancel. Then do it again. By now you may need to use that Super Potion or Rusty Food Tin; Death's attacks hurt when you're using Devil. If he tries to teleport-slash you, take note of where he was when he disappeared, then either guess which side of you he's going to appear on, or hope you have good reflexes. You should have enough time to attack him, then special-cancel. You'll get hit, but you'll do lots of damage to him. Do you remember where he was when he disappeared? He'll reappear in the same place, so fire off Abaddon in that general direction, and then position yourself right near where Death will reappear. As soon as he reappears, attack, back dash cancel into another attack, then special cancel. That should be enough to kill him. If not just keep hitting him. I believe it takes 4 attacks and 1 special, but it will be less if you manage to hit him with a lot of locusts. Beware! You're not done yet! Just like in Castlevania: Aria of Sorrow, Death can still kill you even after he's dead. If he had thrown his scythe at you before he died it will keep going as though Death were still alive and it can still hurt you. A lot. Same deal with his giant, blue skulls of doom; any skulls that were fired off before his demise will try and take you down with him. Also, the second Death is destroyed, pause and equip Black Panther. Unlike in Castlevania: Aria of Sorrow, the timer doesn't stop ticking upon the death of the final boss. In this game, the timer doesn't stop until you've picked up your reward. Jump and fire Holy Lightning while moving to the right. Jump again and hit his feet with your club while still moving right. He should die on your way to the door. To be safe, though, I usually try and club him twice. Just keep doing shorthop double slashes using Shadow Warp to avoid his attacks. If he tries to use his horizontal punches you can jump on his hand and Shadow Warp, then slash again as you fall afterwards. Run towards him. When you're about half a screen length away (usually at about the same time he tries to use Malachi), use Hellfire. Usually only two of the fireballs will hit him. It will knock him back. Run towards him and land-cancel an attack then immediately use Hellfire upon landing. Then use another Hellfire. He should hit you with a Hellfire of his own at this point. Immediately after it hits you, use yet another Hellfire, then slash him once right after that. Back-dash-cancel a Hellfire then start running towards him. As soon as he's within range, start shorthop double slashing, trying to avoid any puppets he may throw at you. If done properly, you will kill him before (sometimes JUST before) he manages to hurt you. Ice. After it hits him you can do a shorthop and club him once, then immediately use Ice again. Just keep doing that. Hold right as you fall and shoot a Holy Lightning just before you hit the ground, then turn around and start backflipping to keep up with him. If he gets too far away the lightning stops hitting him. Try and club him a couple of times while you're over there, then use Holy Lightning once more if he's not dead. Shorthop double slash until he dies. You'll have to avoid a couple of attacks since he takes a while to kill. Shorthop double slash. Back-dash-canceling Hellfire while you're close enough to him to make sure all 3 fireballs hit can speed things up a little bit. At this point, if you have more than 180 HP and enough MP for 4 Hellfires, go to Bat Company, otherwise, grab Zephyr's orb. Bat Company's orb appears faster, however, so it is best to try and beat Zephyr with enough HP and MP so as to not have to grab his orb. As soon as you land, shorthop double slash WITHOUT making any horizontal movement. When you land, just wait. Bat Company will run into you. As soon as he does, hold up and start jamming on the Y button, ignoring the fact that he's damaging you. It takes 4 Hellfires to kill him. If you grabbed Zephyr's orb you shouldn't need to wait for Bat Company's. If you got this far without grabbing an orb you will almost certainly be in desperate need of one, so grab Bat Company's. Shorthop double slashes. When he starts hovering directly over you quickly jump up and slash him once. You will get hit when you try and do this. As soon as you touch the ground, jump up and you should be able to slash him twice without taking a hit thanks to the brief invincibility granted upon taking damage. When you land from that, just wait. As he rears back to kick you, back-dash-cancel Hellfire to dodge the kick. As soon as the fireballs shoot out start shorthop double slashing again. If you're fast enough he won't even start hovering directly over you again before he dies. You shouldn't need to wait for his orb. No real strategy here, just spam Ice making sure it double-hits each time. Just hope you get lucky and he doesn't spam that attack where he flies out the top of the screen since it wastes a LOT of time. Also, remember that you can move around while casting Ice if you cast it mid-jump or back-dash-cancel it. Hopefully you won't need to wait for this guy's orb because Aguni takes forever to die. Just keep shorthop double slashing, as usual. Back-dash-cancelled Hellfires can speed things up just like in the Zephyr fight. If he gets close enough to a wall that you can hit him with your back against the wall there's another way to damage him very quickly. Attack, back-dash-cancel your attack, tap down VERY slightly, just enough to make Alucard duck, then, immediately after releasing down on the d-pad, repeat this process. If done properly you can attack ridiculously quickly. If you're low on HP or MP, grab Abaddon's orb. It doesn't take too long to appear. Shorthop double slash. Again. If he tries to use his charging scythe attack hit him with Shadow Warp. If timed properly (which isn't hard) you'll hit him twice and avoid both of his attacks. Then start going to town with shorthop double slashes again. When he transforms, continue going to town with shorthop double slashes. If he summons skulls, run back and forth to avoid them while jumping and slashing at him. If he throws his scythe, just keep slashing him making sure to avoid his scythe. The smaller sickles aren't as important to avoid since they are far less damaging. If he uses his teleport slash then either guess which side of you he will appear on or hope you have good reflexes. You should have time to use Hellfire, back-dash-cancel it, attack once immediately after back-dash-canceling your Hellfire, then use Shadow Warp. If you're fast enough every hit will connect except that the bottom fireball of your Hellfire attack will generally go under him. Keep in mind that he will always teleport to the same side of you when using his teleport slash, so only the first time he uses it will be a mystery. Equip the Succubus soul (Monster No. 086) and use it. You will notice a red aura around Soma while he performs the move. For a short moment after this red aura vanishes, Soma's momentum will be reset. The Succubus soul's animation can be interrupted by most weapon specials, including daggers and axes, whose specials move you forwards or upwards, respectively. The red aura, however, stays as long as it would have taken the animation to finish. This allows for a number of things. Time an axe or dagger special so that the red aura disappears during Soma's performance. The attack will be canceled and Soma will not finish the move; instead, he will stay where he was when the attack was interrupted. If you are in mid-air when the red aura disappears, you can jump without the Malphas or Hippogryph soul. - The Weapon Special Warp's versatility allows for many sequence breaks and bugs. You can teleport past walls, ceilings, doors, enemies, across rooms, outside the map and into Julius mode. While outside the map, the game might randomly give you glitched abilities or weapons normally only available in Julius mode, or power up your souls past the intended maximum. It is possible to get back inside the castle by suspending the game. Note that there are quite a few ways to corrupt your save game, so always save first or use a copy of your save when experimenting with this. In a New Game+, this allows you to get past the drawbridge at the beginning of the game without glitched souls (i.e. Alucard's Soul of Bat) or draining the moat. Get Flying Armor, activate it and stand on the edge of the ledge in front of the drawbridge. Perform an Axe Special Warp followed by a Mid-Air Jump and press right to fly over the bridge. This glitch basically crashes your game. New Game+ is more convenient for doing this glitch, but New Game also works (just use mana potions instead of Chaos Ring) and on Normal mode since you can't damage Gergoth fast enough on Hard Mode. Enter Gergoth's room and activate Devil. Use the Death Scythe special attack to get the seal prompt in a handful of hits. Basically you kill him before he gets the chance to break the floor. Don't seal him yet, but screw it up so he gets some HP back. Let Gergoth break the floor and follow him to the bottom of the tower. Kill and seal him while his head is stuck in the floor. The usual death animation follows, but he has still the chunk of floor pieces in his mouth. When his head hits the floor, the game freezes. The music keeps playing, but everything else doesn't work anymore, thus forcing you to reset the game. So far there are two ways of raising the percentage over 100.0%. 1. Bat Company Glitch: As Alucard, turn to bat and fly up to the top right corner of the room. Then just wait for the Bat Company boss to do the "hand" attack. As soon as the hand touches you, you'll go through the ceiling; warping for 4 and a half minutes before returning to the room. Make sure you don't switch to any character that can slide—if you slide, you can't get back in the room! Once back in the room all you need to do is kill Bat Company; that's the hardest part of the glitch! 2. Teleport-Slash Doorway Glitch: As Alucard, use the special teleport-slash attack on the right doorway of 2 different "connector" rooms. 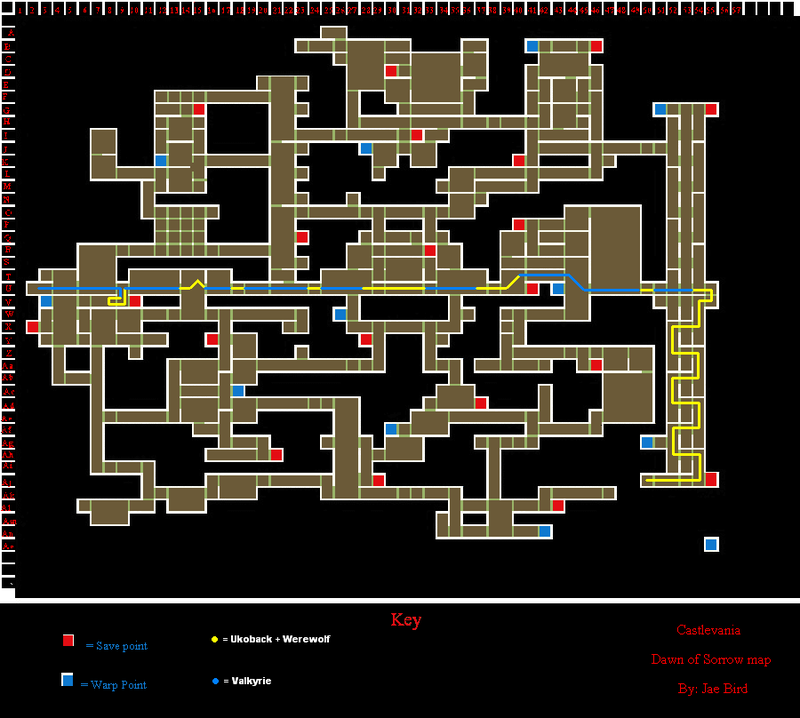 First is the room that connects the Condemned Tower to the Clock Tower; stand on the right side of the right door (in the Condemned Tower) and do a teleport slash attack to the left. Stand at the right distance so that the furthest point of the attack puts you right in the middle of the door, and you will go through the ceiling. Just let your map cursor warp (all controls will be disabled until you return to the castle), after 4 and a half minutes you'll appear in the connector room. The other place for the glitch is the room that connects the Clock Tower to the Pinnacle. Do the same procedure as before, starting on the right side of the right door. Special Note: This glitch can also be done on the room that connects the Subterranean Hell to the Wizardry Lab, but for some unknown reason your map cursor will stop warping after 3 minutes and you will be trapped outside the castle. So any percentage gained here would be un-savable.